Rigorous evaluation is essential to improving international engagement in fragile and conflict-affected situations (FCAS). In recent years, CIPS/FSRN has hosted several events on the evaluation of cooperation in FCAS like Afghanistan and Haiti. 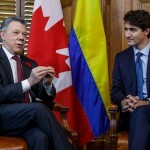 The forthcoming evaluation of Canada-Colombia cooperation, by Global Affairs Canada, offers an opportunity to learn about Canada’s engagement in a distinct context — since Colombia is a middle-income country with a nationally owned peace process. What methods were used in that evaluation and what insights do they yield into the possibilities and challenges of cooperation in Colombia? Are its conclusions and recommendations likely to inform new practices by Global Affairs Canada and its partners? How does this evaluation compare to other assessments of international engagement in FCAS – in substantive and methodological terms?